With the beginning of the holiday shopping season, you no doubt need to keep track of the gifts you’re planning to get for your loved ones. Giftalogs is a site that aims to make gifting ideas easy and help you find the perfect gift for any occasion. The service is currently in Beta, but you can sign up now and start tracking and saving your gift ideas. 1. Collect and save Gift ideas in one location. 2. Write special notes specific to the gifts. 3. Track prices of the gifts and save links. 4. Set a deadline to purchase a gift. 5. Invite your friends to collaborate on your gift ideas. 6. Compare gift ideas in one location. 7. Get gift ideas from friends. 8. Vote for the best gift ideas. 9. Comment on the gift ideas. 10. Track gift ideas for all the people and for every occasion in your life. 1. Sign up. You can even sign up using your Facebook account. 2. 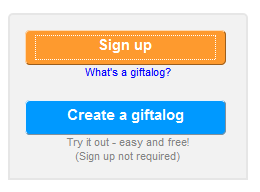 Login to your Giftalogs account. 1. On the Dashboard, on the left pane, click Create a new giftalog link. 2. In the New giftalog page, enter the gift idea. 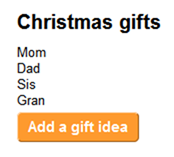 In the Giftalog name text box, enter a name for your gift idea. 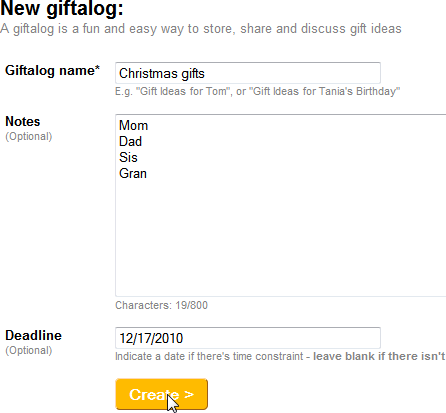 In the Notes text box, enter additional notes such as a budget limit, details of the gift recipients and more. In the Deadline textbox, click to display a calendar and select a date. If there are no deadlines to purchase the gift, you can leave this field blank. 3. Click Create to create the gift idea. 1. If you have just created your giftalog, click Continue to giftalog page button. Else, go to the dashboard and select your gift idea. 2. Click Add a gift idea. 3. In the New Gift dialog box, in the Name text box, enter the gift name. 4. 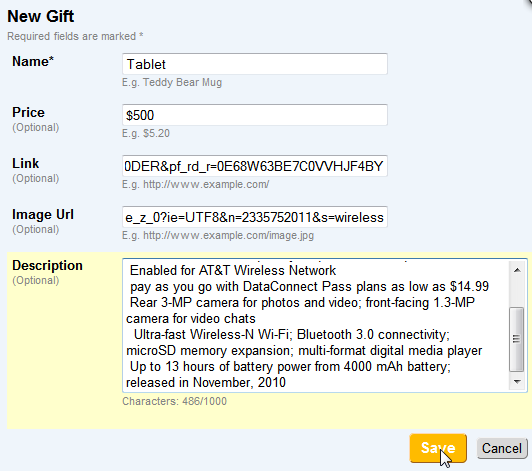 Click the Add Details link and enter the specifics of the gift and click Save. 5. Your gift is now added to the gifts page. You can create more giftalogs and edit, and share these gift ideas with friends. 1. On the navigation pane, in the Helpers section, click Invite others. 2. In the Helpers dialog box, in the Permissions section, set the desired permission levels and click Save. 3. In the Invite others text box, enter an email address to invite a friend or invite friends using your Twitter or Facebook and click Done. 4. Friends who are invited can login as a guest and share comments by clicking the Comments link. If you’re the type of person who loves to collect and share gift ideas, as well as keep track of them, Giftalogs is the site for you. Sounds quite interesting! I especially like the idea about easily signing in with Facebook.